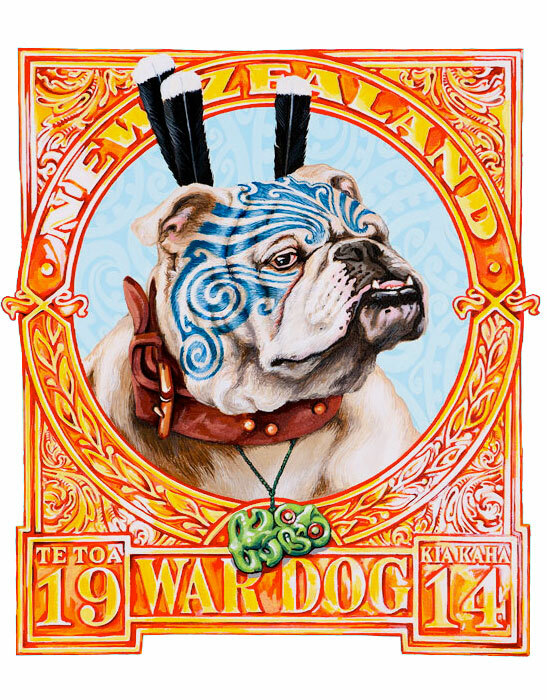 This image was inspired by a World War One propaganda image of the “New Zealand War Dog”. This old image shows a British Bulldog standing on a New Zealand flag thrown across the Union Jack. That 1914 dog wore the three Huia feathers, the Tiki and Moko shown here. I have updated the concept as tribute to the sacrifices made for New Zealand in Europe and in fact all N.Z. military personnel. While I think war is not something to be glorified, the courage and ability to protect ones social structure is an imperative. I believe one of the true Kiwi traits is resolve. The resolve to steadfastly stand behind a value. The men and women who actually put themselves in harms way that we may live free must be remembered and thanked. This dog represents the New Zealand resolve to stand and fight for what we think is right against anyone. This image also though reminds me that the use of the facial moko to designate New Zealandness is not a new thing but part of our character and art stylings for many years, since the birth of the nation really.